Check the Illinois SARE calendar for a full list of programs and links for registration. http://illinoissare.org/ and http://illinoissare.org/calendar.php Also see the University of Illinois Extension Local Food Systems and Small Farms Team’s website at: http://web.extension.illinois.edu/smallfarm/ and the calendar of events at http://web.extension.illinois.edu/units/calendar.cfm?UnitID=629. Feb. 7 Five Years In: What Do We Really Know about Growing and Processing Industrial Hemp? 2019 Southern Illinois Fruit & Vegetable School, Friday, February 8, 2019, Doubletree Meeting & Event Center, 222 Potomac Blvd (formerly Holiday Inn) Mt. Vernon, IL. This year, the program will feature three separate tracks to address vegetable, small fruit and tree fruit production; bringing you an informative, practical, and up-to-date research-based information to address the challenges of growing fruit and vegetables commercially in Southern Illinois. Advanced registration is $40.00 per farm, and a copy of the 2019-2020 Midwest Fruit Pest Management Guide OR the 2019 Midwest Vegetable Production Guide for Commercial Growers will be included in the cost of registration. Advanced registration is preferred and is available online https://web.extension.illinois.edu/mms/ or by mail. The deadline for receipt of advanced registration is February 1, 2019. Registration at the door is $50.00. 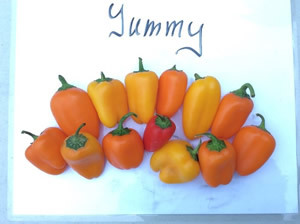 •	Produce Safety Alliance Grower Training Course, Thursday, February 7, 2019 and Friday, February 8, 2019, Pembroke Public Library, 13130 East Central, Hopkins Park, IL 60958. Fruit and vegetable growers and others interested in learning about produce safety, the Food Safety Modernization Act (FSMA) Produce Safety Rule, Good Agricultural Practices (GAPs), and co-management of natural resources and food safety. The PSA Grower Training Course is one way to satisfy the FSMA Produce Safety Rule requirement outlined in §112.22(c) that requires ‘At least one supervisor or responsible party for your farm must have successfully completed food safety training at least equivalent to that received under standardized curriculum recognized as adequate by the Food and Drug Administration.’ Total cost to attend the PSA Grower Training Course is $145. The cost will include PSA Grower Training Manuals ($50) and a Certificate of Course Attendance from AFDO ($35). Other expenses will be for meals, beverages and room rental. To register for the training, visit this website: https://web.extension.illinois.edu/registration/?RegistrationID=19761 or visit the Extension Office at 1650 Commerce Dr., Bourbonnais, IL 60914 to submit your payment. For more information, call 815-933-8337 or email James Theuri at jtheu50@illinois.edu or Carolyn Smith at cls@ctsmithlp.com. Produce Safety Alliance Grower Training Course, Thursday, February 14, 2019, 8 a.m. to 5 p.m. Spoon River College Community Outreach Center, 2500 E. Jackson, Macomb, IL 61455. The registration deadline for this training is February 2, 2019. To register visit https://web.extension.illinois.edu/registration/?RegistrationID=19601. For more information contact Laurie George at (618) 242-0780 or at ljgeorge@illinois.edu. On behalf of University of Illinois Extension, we extend our deepest sympathy to the family and friends of Robert “Bob” Edwards, Sr., who passed away Monday, January 21st at the age of 90. Bob founded Edwards Apple Orchard in Poplar Grove, IL with his wife Betty in 1964. Bob was also inducted to their Hall of Fame by the Illinois State Horticulture Society. The visitation will be Friday, January 25 at the Poplar Grove United Methodist Church from 4-8 pm, 105 E Grove St, Poplar Grove, IL 61065, followed by a funeral service the following day at the church Follow this link for the obituary: https://andersonfcs.com/obituaries/robert-bob-m-edwards/. During one of his presentations at the 2019 Illinois Specialty Crops, Agritourism & Organics Conference, Patrick Byers, Commercial Horticulture Field Specialist with Missouri Extension, mentioned some of the upcoming meetings and workshops being offered this coming year. He provided the following list which may be of interest to many of the IFVN subscribers. My name is Jarai Carter, a doctoral student in Informatics at the University of Illinois at Urbana-Champaign. For my dissertation, I intend to investigate why those in the farming community use Facebook and how this social media platform helps them out in their farming tasks. I am specifically interested in the opinions of those who are at least 18 years old and are subscribed to subscribed to an Illinois Extension email list. No Facebook experience is necessary to participate. Might I impose upon you to participate in this study? As a participant, you will be asked to respond to a survey questionnaire, which should take no longer than 45 minutes to complete. Returning a completed questionnaire makes you eligible to be entered into a $50 Amazon.com gift card drawing. This survey will be available through 01-31-2019 at 11:59 p.m. If you have questions about this project, you may contact me at carter31@illinois.edu, or the principal investigator, Dr. Lulu Rodriguez, at lulurod@illinois.edu. If you have any questions about your rights as a participant in this study, please contact the University of Illinois Office for the Protection of Research Subjects at 217-333-2670 or via email at irb@illinois.edu. Thank you for taking the time to assist me with this study. From west central Illinois… Up into the first part of January, farmers were lamenting that the ground had yet to freeze, which was making any fieldwork difficult. Now the ground is certainly frozen, but there is about a foot of snow on top. In Macomb, we’ve had no shortage of precipitation this winter and we should hopefully go into spring with replenished soil moisture levels. It has been a few weeks since I’ve checked under the plastic on the plants. There is a knee-high drift between me and the high tunnel and low tunnels, and I haven’t had the proper motivation to blaze a trail in the snow. Today I took the plunge for you, the reader. I could only get into the high tunnel. Yesterday it rained buckets, and now it is currently 21 degrees F, with a predicted low of 9 degrees F tonight. Needless to say, the low tunnel plastic is frozen solid to the ground. The plants are on their own. I don’t have much happening in the low tunnels. Carrots, spinach, and kale are my remaining crops and I will assume they are holding nicely under the plastic. There is even less going on in the high tunnel. My Swiss chard finally got hit by the frigid temperatures last week and are no more. 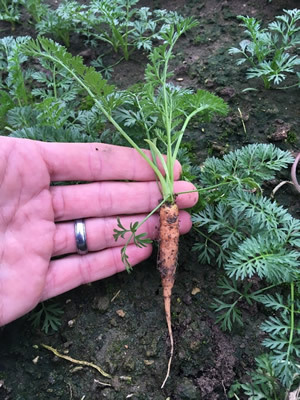 I have been wanting to sow carrots in the high tunnel for January, but the snow, ice and now frigid temperatures have kept me inside. We will be hosting an upcoming Produce Safety Alliance training on February 14 at Spoon River Outreach Center in Macomb. This training is one way to satisfy compliance for the Food Safety Modernization Act (FSMA). Registration can be found HERE. 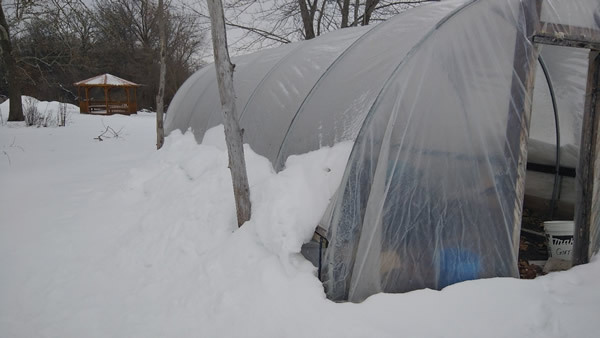 My old high tunnel has always done well shedding snow. This last snowfall was followed by rain and then ice. 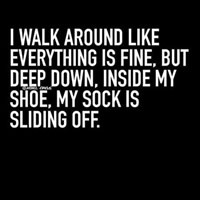 Still things are holding together! Winter annual weeds are a recurring problem in the high tunnel. Some weed pulling is in my future. Photos: C. Enroth. From southern Illinois… It has definitely felt and looked like winter around southern Illinois the last few weeks. Although we have had a few days in the 40s or 50s here and there, for the most part we have been in the 30s and low 40s for highs. We have had two main rounds of snow that have hit the area. The first came the afternoon of Friday, January 11 as some of us were driving home from the Specialty Crops Conference in Springfield. We had about 5” of a very heavy wet snow. This is the same system that dumped near record amounts of snow to St. Louis and north with somewhere between 12-16” in the end. The following weekend we got hit again this time with rain which then turned to sleet and then snow mid-day on Saturday, January 19. We ended up with a layer of sleet and then about 4” of a light fluffy snow by evening. The ground was not froze when this system hit and soils are beyond saturated so most of the snow was melting from below. Creeks and rivers are filling up as our soils can’t hold much of any more additional moisture although no major flooding yet. We also had some rain yesterday (1/23). This is the most saturated I have seen the soil during the winter in a few years. The ground has not been frozen much although this morning (1/24) it was down to about 22˚ and so the ground was froze a little on top. Today is one of the few days lately we have seen at least some sun, but with afternoon more clouds are rolling in. The forecast has us staying between the 20-40s for highs with a few below freezing days and in the next week. There is not much going on out in the field aside for some pruning out in the orchards. In our high tunnel, carrots, broccoli, and greens are still growing. The overall growth rate has been slow, but the October planted greens are finally getting close to harvestable size. Arugula has been way more vigorous than the spinach or leaf lettuce. 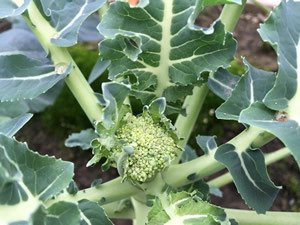 The broccoli is doing well and the early planting now has some small heads formed. The lows in the teens and 20s have been hard on it; however, it still is doing well and will pull through with some warmer temperatures as the heads develop more. Pictures from the Jackson Co. High Tunnel. Lettuce, spinach and arugula (top left), broccoli (bottom left), and carrots (top right). Photos: N. Johanning. 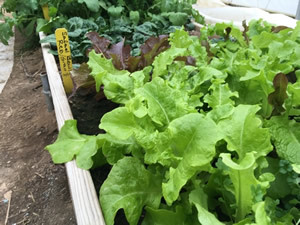 From Dixon Springs Ag Center…Not much happening with the high tunnels at DSAC during these cold winter days. We have been deligent with watching weather fronts that have come through in the past couple of weeks, and luckily, not needing to do any snow removal on the tunnels. Our to do list is ready and waiting for days that will allow progress. We have finally experienced our coldest winter days this past weekend. Seeds have been ordered for the 2019 growing season. 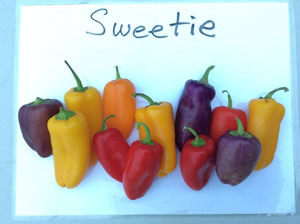 Variety trials were conducted in the 2018 growing season to evaluate the performance of three different varieties of sweet snacking peppers. A no-till trial with 3 randomized replications was conducted at the Murphysboro office. 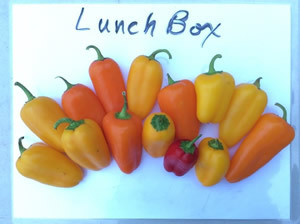 An observational trial using the same 3 varieties was conducted in the Murphysboro high tunnel. The no-till trial was transplanted May 25, 2018 and the high tunnel trial was transplanted May 29, 2018. No-till Transplants in the no-till trial were set 1 ft apart in a single row with 8 plants per plot. The trial had three randomized replications. Fruits were evaluated as either marketable or cull. Plants were harvested 7 times from July 27 – October 14. The harvest season was broken into early-season July 27 - August 9, mid-season August 23 - September 20, and late-season October 5 - October14. High tunnel Transplants were set 1 ft apart in a staggered double row. This trial was observational, with one replication. Plants were supported by string to prevent laying over. Fruits were evaluated as either marketable or cull. 6 harvests were made from August 9 – October 22. The harvest season was broken into early-season August 9, mid-season August 23 – September 21, and late-season October 8 – October 22. All fertility and pest management applications were made according to the recommendations given in the Midwest Vegetable Production Guide, 2018. A special thanks to Johnny’s, Seedway, and Rupp’s for donating the seed for this trial and to Katie Bell our Extension Intern who managed the trials and data collection. The results of the trials are listed in the following chart. Varieties are listed in descending order based on total marketable yield. The NEIPMCommunication-L list is owned by the Northeastern IPM Center, 340 Tower Road, Cornell University, Ithaca NY 14853. The Northeastern IPM Center fosters the development and adoption of integrated pest management, a science-based approach to dealing with pests that brings economic, environmental, and human health benefits. We use the list periodically to publicize IPM funding opportunities, research and extension projects, and IPM news and information. Does unseasonably warm weather in the middle of winter cause fruit trees to “wake up” too early? As with all things in nature, it all depends. Most trees from temperate climates require the accumulation of winter chill (500 and 1,500 chill hours) and subsequent heat during their dormant phase to resume growth and initiate flowering in the following spring. Chilling hours are the number of hours of exposure to about 45°F, and are measured from leaf drop in autumn until mid-February to early March, and are specific down to cultivar. Chilling hours for fruit plants usually accumulate between 35°F and 55°F, with 45° considered optimal. The Midwest Regional Climate Center is close to this ideal; they assume if the temperature at each station at the top of the hour is greater than or equal to 35°F and less than or equal to 45°F (35°F <= T <= 45°F), then the station’s season’s chilling hour accumulation is increased by 1 unit. 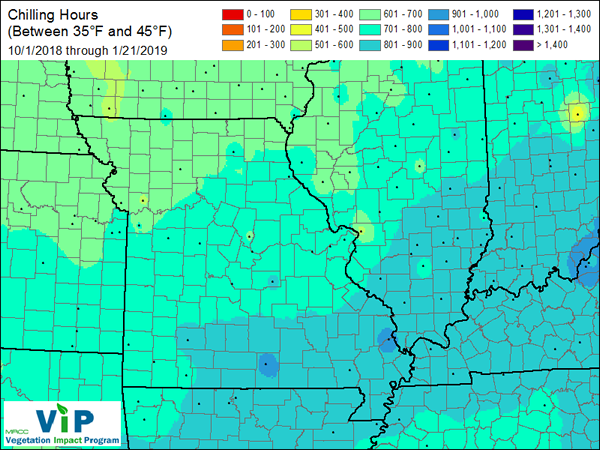 As of January 21, 2019, much of the collar counties of St Louis, with a few exceptions, have accumulated at least 701-800 chill hours so far. This means any temperate woody perennial requiring less than 800 chill hours has most likely met its cool-temperature requirement and is ready for stage-two of breaking dormancy. In stage-2, the temperate woody perennial must then receive a certain number of growing degree-hours (warm-temperature requirement) in order to resume growth. Normally, most temperate woody plants adapted to our climate accumulate sufficient chilling hours by roughly mid-January, then begin accumulating growing degree-hours before resuming growth in the latter half of March. Intermittent warm and cold periods during winter may require more bud chilling than continuous. 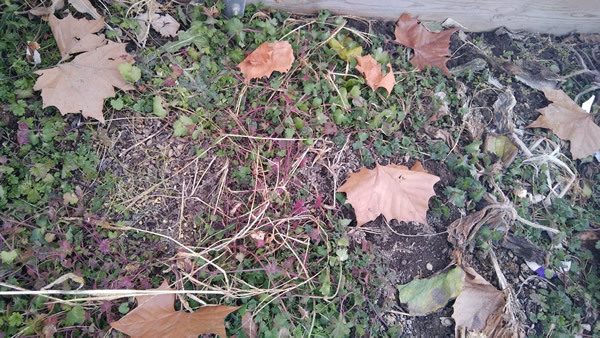 Where we normally run into problems is when temperate woody perennials accumulate their chill requirement too early in the season, resulting in accelerated budbreak and an increased risk of exposure to freeze damage. For this reason, low-chill cultivars should especially be avoided in our region. They tend to break bud at the first winter warm up, then are severely damaged by returning freezing temperatures. This seems to be the case for Prime-Ark Freedom blackberries. As further example, ‘Cresthaven’ peach is well adapted to our region and is reported to require 950 chill hours. Compare that to ‘UFBest,’ a peach cultivar developed for central and south Florida, requiring only 100 chilling hours. If ‘Cresthaven’ is following the books, it should still be snug in its dormancy, while ‘UFBest’ would be primed for a winter kill.